Knock-on® is a patented system and the easiest way of exchanging parts on a cultivator: either in order to adapt the machine for the job to be done or to exchange wearing parts. Kverneland always use steel of highest quality. Thus allowing the Knock-on® system to be based on a simple locking technique: requesting only a hammer to knock on and off the parts within seconds. The Knock-on® range offers five cutting widths with shares of 80, 150, 250 and 320mm and the Quantum share of 345mm to match with various tine spacings and depths requested. This user-friendly system is able to work from 3 down to 35cm in a very economic way. The wide choice of deflectors and tine protections allows the flexible adjustment to changing soil and weather conditions for optimum results maintaining the soil structure and saving fuel. The deflectors are locked by a single bolt. To engage or disengage a share from the holder, it takes only a few hammer blows and 10 seconds. Changing 10 shares at a CLC pro 3,00m will take less than 1.30 minutes - instead of 20 minutes with bolted reversible shares. The upper part of a share system is playing a big role in the work done in terms of incorporation, power requirement and top layer profile. Humidity of the soil can also be determinant for the cultivator performance; therefore adapting the tines with appropriate upper equipment is a must. Only 1 bolt is holding the deflector to allow a rather quick change if necessary. 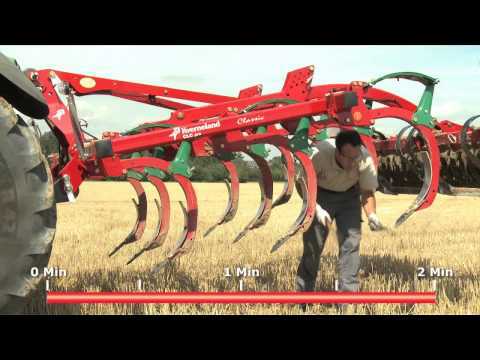 One point for each depth or tine spacing with the choice of 80/150/250/320mm. The Quantum share can be added to the 150mm point to get to 345mm cutting width. FCS (Full Cut System) providing a very flat bottom profile at shallow working depth(ref. DLG Fokus test N° 6029F for CLC pro Classic). High quality steel of 55HRC, 80mm point of 12mm thickness, all other parts of 10mm, designed for long life. Knock-on parts can be used up till 75% of the initial material has gone, with about the same lifetime as a bolted system. This is a very high ratio compared to bolted wearing parts solutions for which usually only 60% can be used. The Knock-on has also proven to be a low power eater by requesting a low pulling force (ref. DLG Fokus test N° 6029F for CLC pro Classic). Large economies on fuel can also be expected.